Micro builder Emil Lidé once again displays his mastery of the miniature with his wonderfully detailed recreation of Lund Cathedral, home of the Church of Sweden. Like his other miniature builds (check out his Avalonian Countryside we previously blogged), this cathedral features a number of delightful techniques to get the most detail in such a limited and challenging scale. The use of masonry profile bricks for the church grounds and grill plates to achieve the windows are particularly nice touches. The landscape is quite detailed given the scale, and I’m happy to see those fantastic trees again. 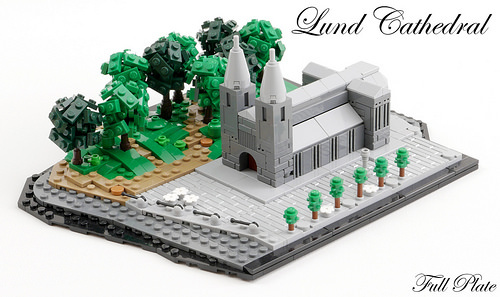 If you’re wondering how Emil was able to build such an accurate model of the cathedral, the answer is simple: he just had to walk down the street, since Lund is his home town.